Naturally Morocco strives to provide our customers with an excellent holiday, with expert advice and exceptional customer service. It makes our day when we receive thanks from customers for their enjoyable holiday, for the wonderful and varied Moroccan experiences and for our help. "Thanks Karen for opening my eyes to a country of warm people, great food and stunning scenery that I will certainly return to"
From the moment I contacted Karen at Naturally Morocco I knew I was in safe hands. Realising that I wanted to get off the beaten track, she put together a varied itinerary which encompassed everything from the magical walled city of Taroudant to the spectacular Anti-Atlas range and onto the fringes of the Sahara before finishing on the unspoilt beaches to the north of Agadir. Morocco totally blew my mind. Thanks to my wonderful driver, Lotfi, I was able to gain a deep insight into the culture, attending authentic festivals in small villages, being invited in to the homes of locals and engaging in conversation with goatherd’s miles from anywhere, experiences that would have escaped me otherwise. And the scenery matched anything I have seen in all my years of travelling the globe. At any given time, I could have been in Iceland or Arizona, Oman or Scotland. But this was Morocco and it was nothing short of spectacular! Jon Vatcher, November 2018. "We had the most wonderful adventure"
I have been so looking forward to contacting you to say a big thank you for organising the most amazing holiday for us and everything you put together for us worked perfectly. Thank you for putting together a fantastic itinerary. We felt like we saw and did so much, but equally that we had time to relax and unwind too. It is a fabulous country, and happily it was a world away from the crowds of the Med. So all in all it was a real adventure, and good for the boys to see something of life in a totally different culture. We really felt like we got off the beaten track, yet stayed in some gorgeous places, and we are so grateful to you for putting together the most amazing itinerary that we just couldn't have done ourselves. Gilly Harper & family, August 2018. "We had a wonderful time in Morocco"
Thank you for having carefully arranged our private tour. All the drivers went out of their way to make our experience a pleasant, safe and memorable one. The tour guides educated us on their culture, religion, customs, among other things. People, in general, were very friendly and helpful. It was truly an eye-opening trip and overall, it was very rewarding. We really appreciate the time and attention to details you put into planning and organizing it. Thank you. Joy & John Timms, June 2018. "We had a superb short break"
It was lovely that such a beautiful, peaceful hotel was only 40 minutes from Marrakesh airport. The room was really special and the staff very welcoming. We relaxed the moment we arrived and felt very spoilt. The gardens were spectacular and the food amazing. We would recommend it to anyone wishing to escape the rat race. Thank you so much, everything ran really smoothly. This is why we return to you time and again. Elaine Craddock, June 2018. "It was really well planned"
We're back from our trip to Morocco about a week - I just wanted to write to say how very much we enjoyed it. It was really well planned, the accommodation was fantastic, and Mohamed was the nicest of guides. Couldn't have been better. We hope to return in 2020, to make a trip to the Sahara with Mohamed, so we'll be in touch in the future. Thanks so much. Mark Roper, April 2018. "Really a fantastic experience overall"
We are home after our lovely tour and I just wanted to send a quick note to thank you and let you know what a wonderful time we had. In particular, I wanted to mention how much we liked our driver for the majority of the trip - Monsieur Ali - we felt that he treated us like family and really looked out for us, making us feel like we were experiencing the "real" Morocco, rather than just the touristy spots. We also particularly liked the Lune et Soleil Riad in Fez. The staff and the food were particularly great there. I thought the tour was very well organized and the places you chose for us were excellent choices. Thank you again for all your efforts. Amy Cavanaugh, April 2018. "We had an amazing time! Thank you!" We loved all of the accommodation - the settings, the rooms and terraces, the food! The transfers were all as we expected and on time. Our chauffeur driven trip for 5 days was great. Rashid, our driver, was excellent - a very good driver, helpful, considerate, interesting to talk to. All in all, we had a wonderful time and would wholeheartedly recommend Naturally Morocco to anyone! Ruth Carrington, March 2018. "Karen, we had an amazing trip!" Everything happened like clockwork and met, and more often than not, exceeded our expectations. We were all very pleased with the way you treated us, and your suggested itinerary and its execution. We could not have been happier and will certainly recommend Naturally Morocco to our friends. Thank you for a great trip! John Korbel, March 2018. "Your company does a good job and we will certainly recommend you to friends"
we had a really good time, the highlight was Omar, so helpful and trustworthy. The Riad in Marrakech was good with a very friendly and helpful owner. The excursion in the Anti Atlas was very informative and enjoyable. Chez Momo is a lovely place with great hospitality. Day trek in the Atlas was very good, the guide was lovely and made the day informative and enjoyable. Jackie Atkinson, February 2018. "We had the most amazing trip, thanks to your coordination"
Our trek in the desert was a highlight for me. The 3 of us ended up in one tent, which was fine, since it was really cold. We even had a toilet and hot water. The food the guides prepared was the best- Berber tagine in a “camping tagine”. We were very impressed with how everything worked like a clock. I just wanted to say this was the easiest planning and vacation I had ever been on. I could not have done this myself and want to commend you and appreciate all that you did and your patience with me. Hassane in Fez really thinks highly of Naturally Morocco and alluded that the company gives everyone “their fair share”. If I return to Morocco, I will definitely use Naturally Morocco. We felt like you were watching over us! Andrea & Todd Barnes, December 2017. "Thank you for organising our holiday for us"
Getting a week of Sun, peace and quiet, good food and some great bird watching really helped us break the winter’s sadness and prepare us for the mad rush to Xmas. Our driver/guide/historian/bird spotter was excellent and I cannot recommend him highly enough. He is perfect for bird watchers like us as opposed to twitchers. He has a great knowledge of flora and fauna, Moroccan history and politics. If we return to Morocco again (so many other places still to tackle) then I will only be approaching Naturally Morocco to assist us. Samuel Ritchie, December 2018. "Superb service at Naturally Morocco"
Nick and I just wanted to thank you, once again, for your superb service at Naturally Morocco. Everything you organised/recommended was first class. We really enjoyed, all aspects. Mohammed and Mustafa and team, at our Riad, were very helpful and hospitable. We met Maria, who was also very helpful. If we visit Morocco again, we will definitely be in touch. Susanne and Nick Bass, November 2018. We had a lovely 4 nights in the Riad Watier in Essaouira. All travel arrangements went very smoothly, the welcome we were given and the subsequent friendly service by everyone in the Riad was excellent. Hayat was a superb hostess including everyone in her hospitality. We were impressed and more than happy with the whole experience. We would use Naturally Morocco again to explore Morocco further. Frank and Margaret Salussolia, November 2018. "It’s just been better than we expected!" Glorious Riad, very friendly staff, wonderful weather. The two restaurants you suggested were outstanding. At great deal of laughter and fun at both. They also baked a delicious cake for my brother and I. Nice treat. I want to come back already and I’ve not left yet. But we all feel so totally relaxed. I’m so grateful to have been directed to you to arrange this trip. Alan White, October 2018. "The standard of accommodation was excellent"
Many thanks for organising such a superb holiday. We were impressed by how efficiently everything came together. The standard of accommodation was excellent throughout, some really interesting and unique places. 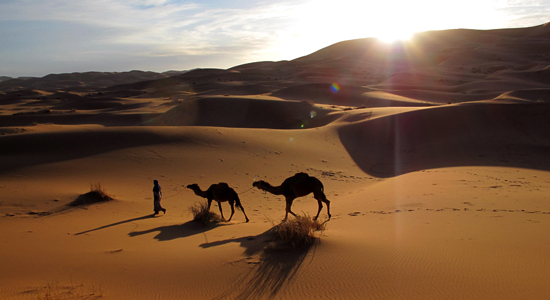 We would highly recommend your company and have no hesitation in using your services if we ever visit Morocco again. Maria Dye, October 2017. "Everything about it was perfect"
We just got back last night from Marrakesh, and wanted to let you know how much we loved our holiday there! Everything about it was perfect - La Maison Arabe exceeded all our expectations, it was amazing! (and we were upgraded to a suite, on account of it being our silver wedding - which made it even better!). We also thoroughly enjoyed our trek from Imlil - stunning scenery, and the people were so kind and helpful. It was a privilege to have experienced it. We will definitely be back! Jan & Nigel Wildman September 2017. Accommodations were both fantastic, beautiful and very quiet. Thank you for all the arrangements and we would definitely use you again if we chose to revisit Morocco in the future! Stuart Chester, June 2017. "We all had a fab trip in Morocco I'm sure the kids will remember it. They said it has been their best holiday so far in their lives!" Overall an excellent holiday, we would love to do Fez and go back to Atlas mountains when we do we will definitely book with you, great service from yourself I would have total confidence in your company. Victoria Cunningham, May 2017. "We just wanted to say that all went well with our 3 weeks in Morocco. We are missing parts of it already!" Thank you for meeting our requirements and answering so promptly whenever we contacted you. The drivers and guides,seemed really proud to be working for Naturally Morocco. The hotel manager in Taroundant also spoke well of you in particular. We would not hesitate to recommend your company. Paul & Sharon Rowell, May/June 2017. "I want to say a big 'thank you' to Karen and Naturally Morocco"
From start to finish, Karen was there ready to make it all happen! My friend and I had a wonderful time at Riad El Zohar, the taxi pick up and collection all went to plan, the official guide was very helpful and all the advice that you gave was very useful. Thank you again, I recommend Naturally Morocco wholeheartedly! Janet Balcombe, May 2017. "Just wanted to let you know that everything about the holiday was perfect!" The staff were incredible. Ali, Omar and Karim especially stood out as going over and above to give us a great holiday. We loved Chez Momo it was exceptional - the pool and the views were stunning and trekking with Ali was great fun. It was a very magical and special holiday. Thanks so much for accommodating our needs so well at such short notice. The information you provided in advance was very useful and the descriptions of places accurate. It was the most fantastic holiday and we would definitely recommend you to anyone and use you in the future. Emily Douce, April 2017. "We had enjoyed our holiday very much. 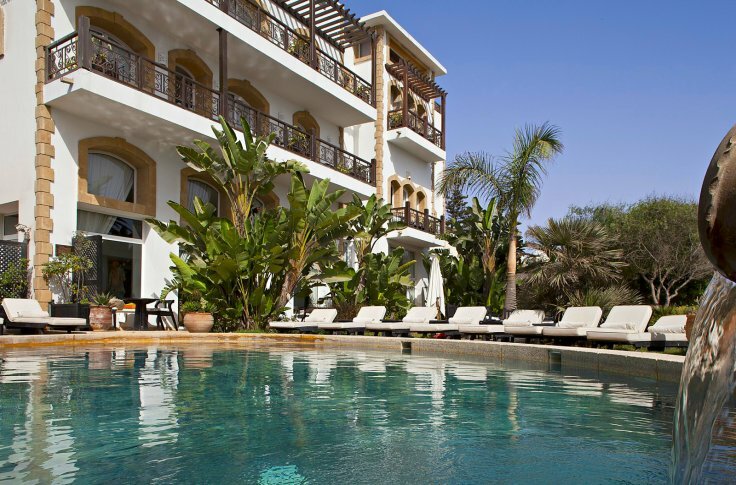 Everything went smoothly"
We loved Riad Darhani, all the staff were very warm, friendly and helpful. 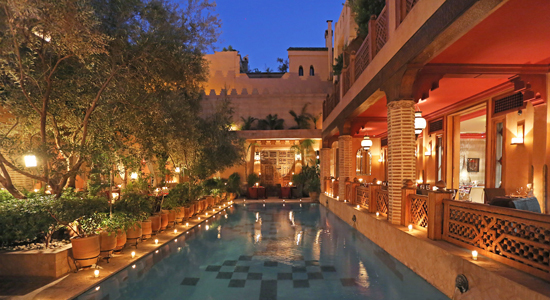 We found the riad to be well sited-quiet and peaceful location away from the hustle and bustle of the medina. Tasty, plentiful breakfasts, the pool and the roof terrace were particularly welcome features after busy days out and about. Thank you once again for all your help with the holiday arrangements. I'm sure we'll be going back to Morocco! Margaret Lyon April 2017. "As always we had superb service from you"
We’ve used you now 5 times I think, everything was seamless and this time I took a friend with me who had never visited Morocco and she was absolutely thrilled with everything. The Kasbah was wonderful, so relaxing and a wonderful location. Jackie Davies April 2017. "We had a fantastic trip, and in large part that was due to your coordination of our 14 day stay". We were all so amazed at the coordination among the different parties. Each ride arrived on time, knew who we were and off we went to the next adventure. All drivers and guides were as pleasant and courteous as can be - and very helpful. all in all it was a great trip. Thank you again for your help. I have passed on the name of your agency to many already, including a group of four who are going to Morocco. Barbara &DaveBroadwin, March 2017. "We had a truly fantastic trip"
All the birds and butterflies we hoped for; had some time to enjoy the beach and the good food etc. Mohamed is a brilliant guide and pleasant company as well. And staying at Dar Haven was a real treat: friendly and beautiful. All in all, we are very happy with everything. Well done, Naturally Morocco! Rauno and Anneli Väisänen March 2017. "I want to thank you for your terrific assistance"
And let you know that I had a wonderful time visiting Morocco! All of your advice, planning and assistance combined for a magical vacation. I cannot wait to visit it again! Ann Longmore March 2017. "We had a fantastic holiday thank you"
Lots of great food and exploring in both Marrakech and Essaouira. Riad El Zohar as I knew from my first trip was lovely, if very quiet (we were the only guests), and Alan was very helpful in terms of suggestions for sightseeing. Heure Bleue was a little bit of a luxury choice for us – we were won over by the rooftop pool which was amazing. Thanks again for all your help organising the trip! Jemima Benstead March 2017. "Neil and I lovely holiday"
The organization/arrangement for travel there and back, the taxis organised to take us between our locations was very well planned. The Riads were nice clean comfortable, the staff very helpful and friendly. We would like to return and would certainly look at your alternative types of holiday. Thank you. Elaine O'Connor March 2017. "We returned yesterday after a fabulous time in Morocco"
Everything worked really well (even the flights were almost on time). We were very impressed by the driver, Hassan, who was always on time and very informative about where we were going and what was going on. The hotels were all very good - we particularly liked the L'ma in Skoura. Will definitely recommend you to any of our friends thinking of visiting Morocco. Kenmir family February 2017. "It was a lovely family holiday and a great mix"
thought your itinerary was excellent. THe long drives did not seem to matter as the roads are so good and the driver excellent - he chatted away to our son in Arabic and us in English! I would recommend you and this trip to anyone. I am very grateful for the careful attention you gave to it all, it took all the worry out of it for me.Thank you again and I wish you a successful and happy 2017. Sam Bickersteth December 2016. "From the minute we landed until the last farewell at the airport, the trip was seamless"
Thank you for taking care of all the logistics, giving us the most enjoyable holiday. We definitely felt the Moroccan hospitality and look forward to the next time we're in Morocco again - we will certainly contact you. Warmest regards and happy 2017! Luanne and David Winchiu December 2016. 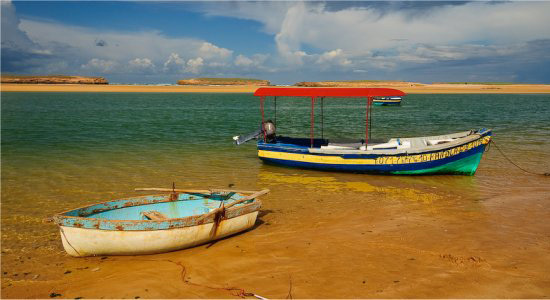 "Thank you for enabling us to visit Morocco – we loved it"
The Ocean Vagabond hotel in Essaouira was excellently located – close to Old town but also to the beach. The souks were fascinating, the surf was fine – not huge but fun enough for the kids to enjoy. Marrakech is thrilling – I will go back sometime. The El Zohar riad was lovely, restful and superbly located - a sanctuary in the middle of such a bustling riveting city. What more can I say!... Ah yes: we should have booked two weeks not one! Hughes-Hallett family December 2016. "We had a great trip thank you and would certainly recommend Naturally Morocco"
Both the drivers you supplied were fantastic, very careful and knowledgable. We loved Chez Momo, Chez Amaliya and the Kasbah Tizourgane- very memorable experiences and the staff in all cases were great. The camel ride was also a highlight. Sara Roberts December 2016. "Many thanks for doing such a great job"
Generally, you did an excellent job putting together this itinerary after I told you our interests. I've done a lot of world travel and this is the first time I've handed over the reins to a professional to organize a trip for me. It was well worth it. We had a fantastic time and hope to return for another visit to Morocco in the future. When I do, I will certainly ask you to plan it! Many thanks and Happy New Year! Eileen Enbar & Malka Percal December 2016. "If you were on Trip Advisor you would get five stars"
A big thank you for doing all the work you did arranging our stay in Morocco, all the elements you put together worked really well, drivers, times, dates, excursions, I work in the travel business, in a way, and if you were on Trip Advisor you would get five stars. Once again, many thanks. Phil & Sue Howe November 2016. "We have thoroughly recommended the holiday to others"
It's been seven months after our wonderful holiday with Naturally Morocco. We loved La Maison Anglaise in Taroudant, the staff, the excellent service we received and the experiences arranged for us, including those delicious meals and visiting the hammam was memorable and delightful, by the way. Thank you also for your help while we were choosing what to do and where to go in Morocco. Because you had been to the country, it was good to hear about your first hand experiences. Fiona Thurburn-Huelin April 2016. "We had a wonderful holiday"
We really enjoyed the mixture of the three different locations - all very different and special in their own way. We really enjoyed our time with Mustapha and the camel ride - a little surprised at first that we all had a camel each considering the children weren't that old, but actually they loved it and I think it really was the highlight of the holiday. Mustapha was very kind with the camels and you could see they were well treated and looked after. We were really taken with Morocco and weren't sure what to expect - there is the obvious anecdotal stuff from friends but this isn't the same as experiencing it yourself. As a family holiday it was just magical. Thanks again for such a relaxing and great holiday. Nancy Pearson October 2016. "Thank you very much for organising the best holidays we've been to"
Even after couple of weeks at work and with our children back from 6 weeks at grandparents, I still am in the holiday mood! Sahara was the best part of the trip. It is something that can't be explained, one has to feel it... and we saw a sandstorm! Definitely our best holidays!Thanks to You! Pawel Lewandowski August 2016. "Fab holiday. Thanks for everything"
All the connections worked like clockwork. Some lovely hotels and enjoyed the trek - i'm not very good with the basic accommodation, but the walking, food and guide/muleteer make it all worthwhile. 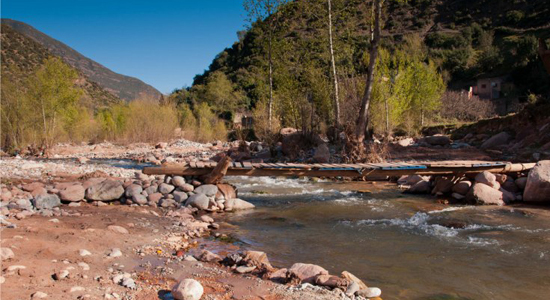 Karim recommended a garden to visit between ourika and marrakech called Anima which only opened in April. Had a great time in Essaouira with our sons. Thanks again for sorting out a great holiday - I'm sure we'll be back. Gill Vaughan August 2016. "Everything turned out perfectly as always"
Despite the 2 hour delay at Gatwick, we still arrived at Ourika Garden in time to get a quick wash and brush-up and to be served a delicious meal in our room. We were even given an upgrade to the enormous Douiria Suite which was a very nice surprise. Karim is an excellent host and Said and the rest of the staff were always helpful, efficient and friendly. Nothing was too much trouble and we were made to feel very welcome and at home during our stay. Thank you all once again for all your efforts in making our latest Moroccan holiday so enjoyable and memorable. Lee and Joanna Tanner August 2016. "Well done again Naturally Morocco for another great trip!" 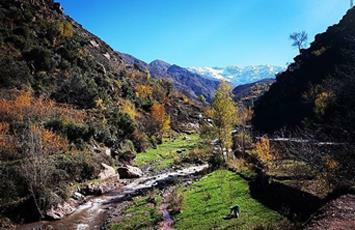 Taroudant is definitely a hidden gem & wouldn't hesitate to go back there to do the excursions we didn't have time to do. Palais Oumensour was a fantastic base, the staff were lovely & the accommodation & facilities were just perfect. I can honestly say we had the best of both worlds, felt like we experienced real Morocco but had the luxury of returning to the Palais to relax in lovely surroundings. So, all in all Karen, we had a fabulous holiday. Your organisation and choices for us were perfect. Thank you very much for what you did for us. It is our second trip with you and we enjoyed this one even more than the first (and we enjoyed that one so much we came back for more). Carol Hutchinson & Jane Walker July 2017. 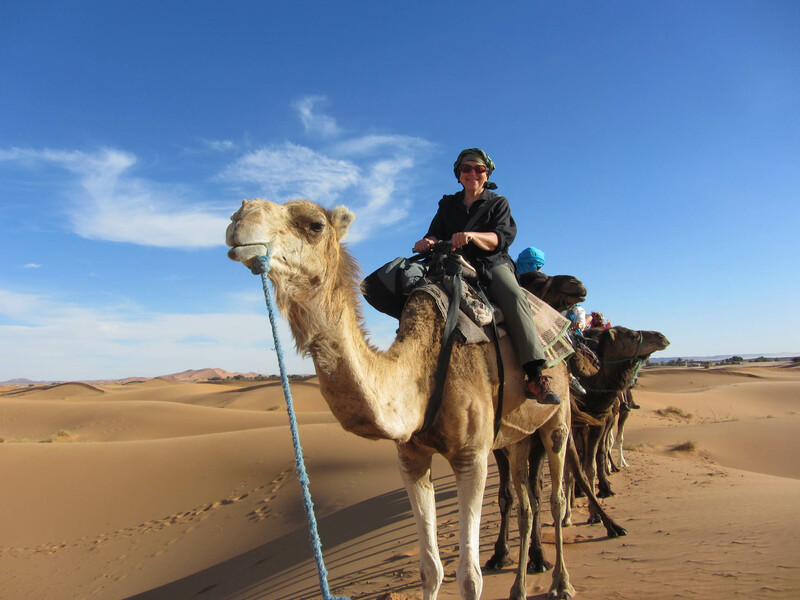 "We had an absolutely wonderful trip to Morocco"
Highlights were definitely the trekking in the High Atlas, Marrakech and Riad Cinnamon, Ait Benhaddou, Camel Safari and Essaouira (L'Heure Bleue was fabulous). All the accommodation was wonderful. The gites in the mountains were basic but clean and everyone was very friendly. The muleteeers produced delicious lunches in spectacular settings. Everything went like clockwork so thank you so much for all your helpful advice and wonderful organisation. We all rated it as one of our best family trips! Hatrick family July 2016. "Our holiday went very smoothly and was very well organised"
We were impressed with the quality of the accommodation and the helpfulness of all the people that you provided for us. In particular, Jean at Riad Watier was incredibly warm and welcoming, inculding taking time out to organise lunch of grilled sardines for us in the souk at Essaoira. We also liked the way that we were passed from the care of one person to another without ever being left to fend for ourselves. Thanks for organising a great holiday to a really interesting place. Andrew Ede May 2016. "We had a marvellous holiday, thank you!" We particularly enjoyed visiting Fez and Meknes. Riad Ghita in Fez was very welcoming, despite our late arrival. The food tour in Fez was a great success. Hassan had already given us a very interesting tour of the medina in the morning. What an amazing place! Many thanks again for organising a very successful holiday - our fourth visit to Morocco. Nick Munton June 2016. "Back home from our holiday in Morocco". John and I had a fabulous time and it was an experience! The final ascent to the summit of Toubkal was indeed challenging! Much deep snow around but the weather at the summit was perfect- blue skies, no wind, and warm. The descent to the refuge was difficult in the snow - we took crampons but in the end we did not use them. The guide and muleteer were both magnificent with plenty of food and refreshments in the most impossible situations. Kasbah Toubkal was lovely and the staff attentive. I felt that during theholiday none of the staff could do enough for you. It will certainly be a holiday to remember. Caroline Wilkinson May 2016.
for masterminding another memorable holiday. We really appreciated the exemplary support of Karen right up to point of our flight and for taking into account our personal requirements. All arrangements worked seamlessly, from the man at Essaouira who guided us to our taxi to the man who put our luggage on the belt as we departed. Everyone was kind, considerate and very knowledgeable. Anne & Pat Clarey May 2016. My "dream trip" to Morocco. I cannot say enough good things about this company, "Naturally Morocco" and my agent Karen. Right from the beginning, the organization and creation of the trip itinerary was fun and effortless for me. Emails were detailed and prompt. Trip info was excellent. Karen was always so receptive, kind, professional and accommodating. Having the trip organized in this way , made for a stress-free holiday! Kudos to "Naturally Morocco" and I will certainly recommend them to my friends and fellow travellers. Diane Canilla Apr 2016. "So in short - it was everything we'd hoped and more!" All the accommodation you'd arranged for us was beautiful and a real treat, ticking all the boxes of feeling like something much more special than we might previously have stayed in when we travelled in 'developing countries' but with integrity and a root in the locality. We'd never done a trip where someone collected us from a hotel and took us to another place but all the guys were fantastic and we loved those journeys. I especially loved the unexpected stop off at the TinMal mosque. Jo Polack, April 2016. "We had a really great holiday". All of the riads etc were comfortable yet quirky, and every single person in them was really friendly and helpful. All the arrangements went really smoothly, thanks to you. Judie Stryus Apr 2016.
and loved the country and the people. Thank you for your help on our Moroccan adventure and we will be encouraging others to visit Morocco and to use your services. Bob Cannon Mar 2016. "We so loved our holiday with Naturally Morocco". I have been emailing my friends all our photos and telling them how efficient your company is. many many thanks to you especially for your dedicated help to making our holiday interesting, stress free and magical. And at such a good price too! Flossy Dixon Feb 2016. "I had a really wonderful holiday thank you". It was a real luxury to have everything organised so efficiently. Thank you for your help and support in making it a great holiday. Amanda MacKenzie Jan 2016.
and could not be happier – well maybe more time. We were thoroughly looked after by your staff and blown away by their language skill, knowledge, kindness and hospitality. Good job everyone. Bev Fidler Jan 2016. "We are back from a wonderful holiday to Morocco". Thank you all so very much for organising everything. Thank you so very much for a wonderful holiday! if only there was a "Naturally...." for every destination in the world! Charlotte Kissack Dec 2015. "We had a wonderful experience, and plan to return". The accommodation in both places was brilliant, as were all the staff. All the arrangements went very smoothly, so we just had to concentrate on having fun. Angela Goldberg Nov 2015.
and everyone in our party commented on what a calm place Morocco was to visit. We would have no hesitation in going back there with our children next time. Many thanks again for your excellent itinerary and wonderful staff. Sandy Miles Nov 2015. "All safely home and totally adored our holiday". It was all made SO easy thanks to you! Honestly we feel like we have had a month long adventure in what was only 5 nights…. Now plotting more adventures and would most certainly recommend you and contact you again for our next trip. HUGEST THANKS from the very happy Morison family. October 2015. "We had a fabulous time". All the arrangements worked very well. Thank you so much for arranging it all. If anyone enquires about Morocco I wouldn’t hesitate to recommend Naturally Morocco. Claire Barchard October 2015. "Thanks for a great holiday". We have lived all over the world, and travelled a lot, but thought Morocco was one of the best places we have been. Quite a few of the hotels said they really appreciated the fact that you went out to see them at regular intervals. Simon Maxwell September 2015. "We had a brilliant time in Morocco". It was an absolutely amazing trip. Everything ran to clockwork, all the pickups and taxi journeys were on time and comfortable. So all in all a fabulous holiday. I would strongly recommend your company as it all ran so perfectly, so thank you so much. Judi Tipping August 2015. "We had an amazing holiday!!" Don't worry about the taxi mix-up, it wasn't a problem and we appreciated how quickly you and Sue handled it. Thank you again for all your help arranging our trip! Caitlin Piette June 2016. "We had a really lovely time"
And we met several other guests who had booked through you all of whom agreed your service is excellent. I wish you covered other countries too as it made such a nice change to use a travel agent with so much insider knowledge. Becky Stephens May 2015. "Thank you for arranging a fantastic trip for me". Everything went to plan and I felt very special all the way through. Wonderful memories which will stay with me forever. Janice Scott May 2015. "Your organisation was first class". Everything was prepared for us in a simple and extremely efficient manner and it was a delight to be directed in all the appropriate directions. Thank you for your highly professional service (at a most reasonable price). Tim Perks May 2015. "We will be recommending you" to all the other 60 somethings we know who might be a little apprehensive about Morocco but just need a nudge from those like you 'in the know' and then they can pretend they are still 'independent travellers'!!". David & Anne Pollard May 2015. "Thank you for sending us to some great Riads"
Hello, we are back from a great holiday in Morocco. Thank you for sending us to some great Riads and meeting some lovely people not only at the accommodation but in Morocco. Jayne & John Thomas Apr 2015. "We felt very well looked after on our first trip to Morocco"
We greatly enjoyed our holiday at La Maison Anglaise. (Taroudant ).The staff were courteous and helpful, their advice & support was invaluable. We felt very well looked after on our first trip to Morocco. Jacky & Keith Bright April 2015. 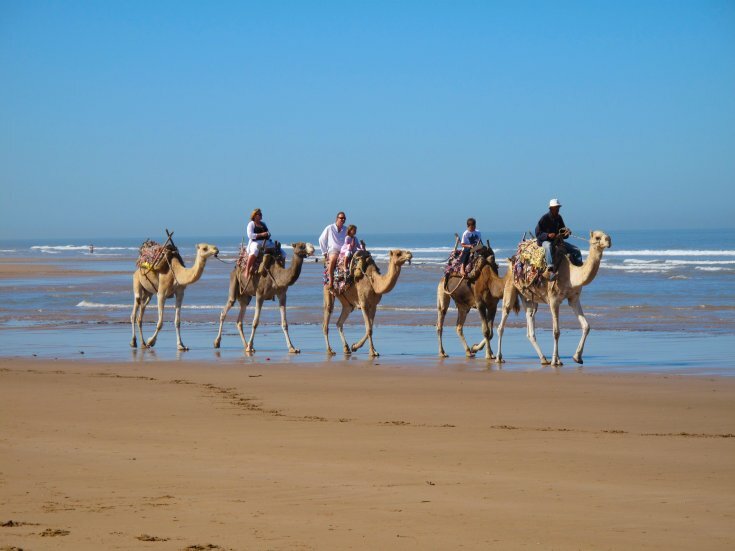 "Exceedingly helpful and you organised a very successful trip at fairly short notice"
Everyone at Naturally Morocco was exceedingly helpful and you organised a very successful trip at fairly short notice and allayed all my worries ! Thank you very much. I would thoroughly recommend you to any of my friends. Lynda Cook April 2015. "The kids are keen to go again!" We have just arrived back and all had a fantastic time. The kids are keen to go again! Thanks for all your organising. Mabel Nyhus April 2015. "The children have proclaimed it 'the best holiday ever'"
Thank you so much for our wonderful holiday. The children have proclaimed it 'the best holiday ever', and we don't think they are wrong. Kate Eretra April 2015. "Surpassed our expectations in every way"
Thank you for organising an amazing trip to Morocco for me and my family. The trip really was incredibly and surpassed our expectations in every way..the accommodation was all fabulous and the people who helped us along our way faultless in their service. Kirsten White April 2015. "It was a dream trip and we would highly recommend Naturally Morocco"
We had a fabulous trip to Morocco and appreciate the professionalism of everyone involved in our trip. We loved all the Riads - they were exquisite and unique.It was a dream trip and we would highly recommend Naturally Morocco to anyone interested in a traveling to Morocco. Vivian Albers April 2015. "The welcome, food and hospitality was exceptional"
The organisation and planning was exceptional and thanks to Naturally Morocco everything went smoothly and to plan. The accommodation was spot on and whilst every riad and hotel was different they all had character and the welcome, food and hospitality was exceptional. Steve Axon March 2015. "It felt good to have real personal service"
I loved that absolutely everything had been planned really well by yourselves and the staff at both Riads were also very helpful. You will be pleased to know that our itinerary went exactly as planned. I also loved that NM phoned me and spoke to me personally in order to get a good idea of exactly what was on my wish list, when I made my initial enquiry - it felt good to have real personal service. Debbie Gray March 2015. "We were impressed by the quality of the tour planning"
We were very pleased with the quality and variety of the accommodation, and the professionalism of the drivers and guides. And before we went we were impressed by the quality of the tour planning carried out by you and your colleagues and your attention to detail. We would unreservedly recommend Naturally Morocco. Shaun & Pauline Murphy February2015. "All seemed impressively easy for us"
We had a great time and all seemed impressively easy for us, definitively, an amazing organisation behind the scenes. Ian & Victoria Coates Feb 2015. "I loved every moment of it"
I had a fabulous time in Morocco, thank you. I loved every moment of it. My hosts and guides were so kind, hospitable and knowledgeable, and I really enjoyed all the excursions and tours. I will definitely be returning and will recommend your company to fellow adventurers! Annabel Du Boulay Jan 2015. I would like to say that the service provided by you is excellent, both pre-booking, information provided and answering the query I had whilst away. The trip was excellent Claire McCue Jan 2015. Spectacular trip in all ways. Thank you. Seamless and professional organisation in all respects. Went like clockwork. And even an email query from me on Boxing Day morning was replied to perfectly within 30 minutes! Steve & Judy Lumb Jan 2015. "Your prep work and information and responsiveness were terrific"
We are just back from Morocco and can't thank you enough for making our holiday truly memorable. 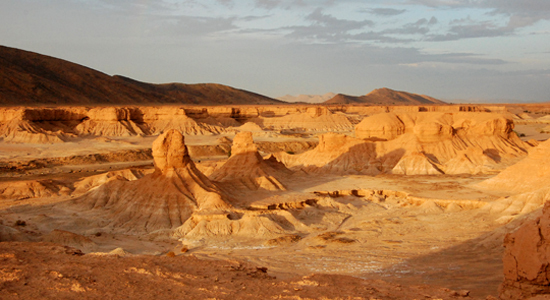 We would be delighted to recommend Naturally Morocco to anyone traveling there. Your prep work and information and responsiveness were terrific.We were absolutely thrilled with the guides and drivers with whom you connected us. Martha Ann Toll Jan 15. "Amazing break in Morocco, which surpassed ourexpectations"
We had an absolutely amazing break in Morocco, which surpassed our expectations. All the accommodation you arranged was of a really high standard. We were travelling with our sons (5 & 7) and everyone was so helpful. Charlotte Jenkins Dec 15. "We thought it was excellent value"
We had a wonderful holiday, and Thank you so much for your organisation. We thought it was excellent value and a great experience. Anne Bartlett Dec 14. "So impressed I recommended a client to your company"
Everything about our holiday was excellent. We had a fantastic time and everything ran like clockwork. We will definitely be back. So impressed I recommended a client to your company and you have arranged his trip for 2 weeks time. He is really pleased to have found you. CarolineFritche Nov 14. "Our holiday would not have been the same without your help"
We had the MOST fantastic week with our five children. Transfers and accommodation were perfect and far exceeded our expectations. Everything ran like clockwork and we would/have recommended your company to friends thinking of doing a similar trip. Our holiday would not have been the same without your help. Many thanks to all. The McIntosh family Nov 14. "We met some really lovely people and discovered a beautifulcountry"
We had a fantastic holiday which exceeded our expectations and certainly hope to return before too long. We met some really lovely people and discovered a beautiful country. I found the service provide by Naturally Morocco to be excellent in every way and would not hesitate to recommend the company to friends. In particular your prompt responses to queries and detailed knowledge of the accommodation and areas we visited was invaluable. Accommodation in all three locations was exactly as described and booked, and the transport efficient and reliable. Nicky Nicholls Nov 14. "Very impressed by the hotels and people you use"
We had a brilliant holiday in Morocco and were very impressed by the hotels and people you use. You have obviously researched them well! Nicki England Nov 14. "I have never been on such a well organised, well thought out, interesting and varied break"
We all had a wonderful time. This is the first time that i have ever contacted a holiday company after a holiday but i felt it was necessary in this case. I have never been on such a well organised, well thought out, interesting and varied break. Overall we found the hotels to be of an exceptional standard, the places we visited were fascinating but the unsung heroes of the break were probably the taxi firms, esp Saeed, who were punctual, efficient, safe, clean and utterly trustworthy. The same I think can be said for Naturally Morocco again who provided an utterly reliable itinerary. I have no qualms whatsoever in recommending NM to anyone who is interested - indeed I have already suggested to to other friends to contact you if they are thinking of going to Morocco. James Chatfield August 2014. "We also like to pat ourselves on the back for choosing awonderful operator"
Thank you for giving us a wonderful 18 days! Of course, we also like to pat ourselves on the back for choosing a wonderful operator, and for making the effort to work out an itinerary, and making the bookings to make the trip worthwhile. Alan Li May 2014. "Everything went beautifully to plan"
We had a truly fantastic holiday - many thanks for organising it. Everything went beautifully to plan, the Riad in Marrakesh was spectacular, and the children (and us!) were very well looked after. We look forward to returning again sometime! Sheena Warman April 2014. "We were a little apprehensive"
Having visited Morocco over 20 years ago we were a little apprehensive about returning with children and the potential hassle we would get but booking through you took all that away and everything went incredibly smoothly and well - a perfect family trip - adventure, culture, shopping and chilling by the pool! Thank you for making in all run without a hitch. Adam & Alice Smith April 2014. "The Moroccan people were all totally charming"
We had a fantastic holiday! Wonderful hotels, amazing weather, smooth travel arrangements, really interesting places to visit and the Moroccan people were all totally charming. So, a huge thank you for all your recommendations and also for planning everything so well. Claudia Jenkins April 2014. "I was a little nervous about travelling somewhere a bit more..."interesting" with our 18 month old." Naturally Morocco and all of the providers (hotels, drivers, guides, etc.) were so fantastic. 5 stars, all the way! To be honest, I was a little nervous about travelling somewhere a bit more... "interesting" with our 18 month old. Though I'm a seasoned traveller, travelling with a little one is a whoooole other world, and I needed the emotional support of an agency to help make sure things would be as seamless as possible. I'm so very glad I chose Naturally Morocco, and wouldn't hesitate to recommend them to anyone! Jane Noon April 2014. "We have memories that will last a lifetime"
Where do we start....our holiday was simply fantastic and far exceeded our expectations. The organisation you provided before the trip was exemplary answering all our questions, ( and we did have lots!) and even phoning us whilst we were there to answer the final few questions. All the staff we dealt with both in the UK and in Morocco were fantastically helpful. We have memories that will last a lifetime Keith & Hilary Southwell April 2014. "Everyone we dealt with was extremely professional and helpful,"
We had a fantastic time thank you and were very impressed with the service that we received and have already recommended Naturally Morocco to several friends! Everyone we dealt with was extremely professional and helpful, and I would not hesitate to contact you when we decide to return to Morocco, which we definitely will! Esme Ford March 2014. "We found the whole experience from our initial enquiry to ourreturn home fantastic"